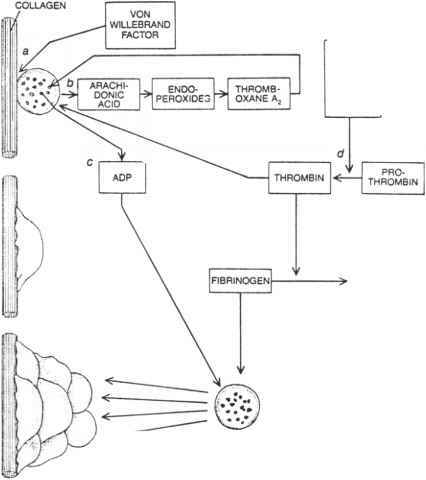 figure 16-20 Complex interactions of platelets, their constituents, and other substances involved in the formation of the hemostatic plug and of thrombi are still not understood. Some are diagrammed here. Contact of a platelet with collagen (1) in the presence of von Willebrand factor (a) initiates a pathway (b) that stimulates the secretion of ADP from the dense granules (c). 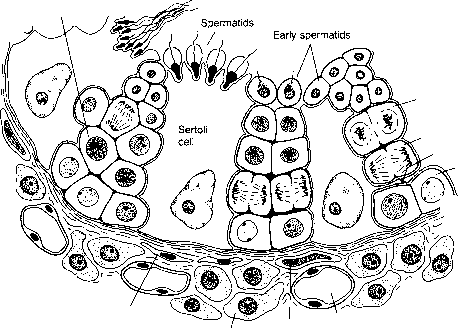 The adhering platelet changes shape, spreads out along the collagen, and degranulates (2). Meanwhile, a number of steps involving tissue factor, calcium ions, and other clotting factors convert prothrombin in the plasma into thrombin (d), which is also formed on the platelet surface. Thrombin also stimulates secretion and converts fibrinogen (from the plasma and platelets) into fibrin. Platelets aggregate under the influence of collagen, ADP, and thrombin (3). Strands of fibrin reinforce the plug. The process may stop at this stage or may go on to form a larger thrombus with trapped red blood cells (4). Reproduced from Zucker, M. b. (1980). Sci. Am. 242, 86-103.